Steve Jobs demoed four videoblogs at the keynote. ABC, Comedy Central, National Geographic... and Rocketboom, sort of. Rocketboom is there, but Steve Jobs didn't demo them or mention them. They've been downgraded from last years keynote. Still it rates a congrats to Andrew and the rocketboom crew, but I can't help but wondering about what Steve Jobs intentions are for for videoblogging and podcasting that's NOT made by the same old mainstream media. And yes, I'm still damn ticked off apple hasn't put linkbacks, aka. permalinks, in the iTunes interface back to videobloggers and podcasters. 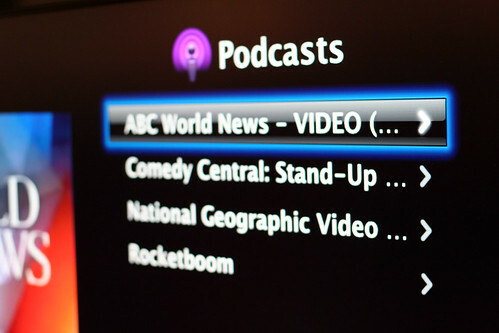 From: Podcast browse on Apple TV on Flickr - Photo Sharing!